I know it's Tuesday and this is a Meatless Monday post but this dish is so good I wanted to share it (and I wasn't able to post yesterday, oops!). Let's talk about this...Ghost Pepper Macaroni & Cheese. It's not for the faint of heart or those who are on the fence about spicy foods. It's for those who crave the heat of peppers and love to eat it in anything and everything. Do you have a bottle of sriracha in your refrigerator (or pantry)? This recipe is for you :). If you've never had a ghost pepper, it's known for being really really hot. It's also known as a bhut jolokia (ghost pepper is easier to remember yes?). There is supposedly only one pepper that is hotter than the ghost pepper, which is said to be 400 times hotter than tabasco sauce (according to Wikipedia), 400! Are you ready to try it if you haven't? I mean, don't eat it straight or anything, although there are ghost pepper eating contests. Yeah, that won't happen anytime soon with me. Don't be afraid though, I'm not asking you to sprinkle the powder (which they do make) into something. For this recipe I used some Renfro's Ghost Pepper Cheese Sauce. Renfro's is the maker of some of my favorite salsas. They also have a Ghost Pepper Salsa which is delicious but spicy spicy hot. The habanero salsa is my favorite, it's just spicy hot :). I also like to bread their jalapenos and fry them on our "Fry-days" that we have every few months. I've talked a little about them before, it's where we fry everything we eat for dinner that night, like mozzarella sticks, jalapenos, pickles, onion rings, whatever sounds good that day. It's not a healthy dinner but it's a fun treat since we rarely fry anything. 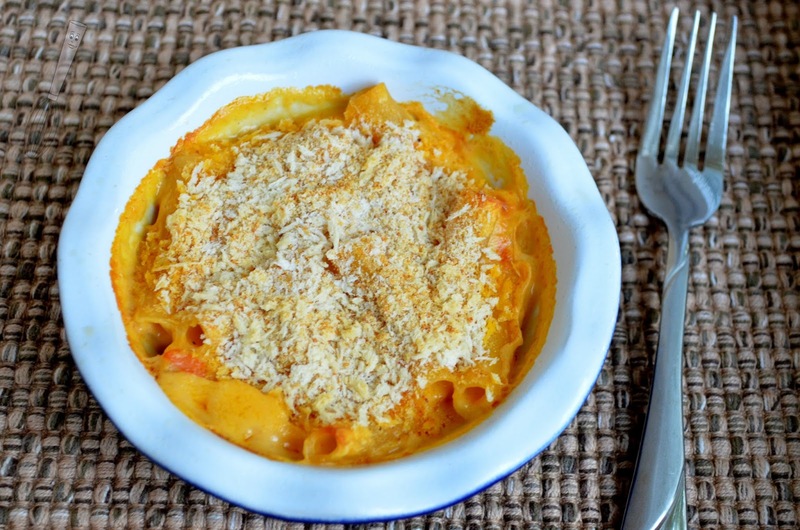 So, this mac and cheese is really easy to put together. It has a topping but if you don't like topping, then you can skip it. If you put the topping on then you need to bake it, but obviously you can skip the baking to if there is no topping. I like the crunchy topping though. But if you want a pretty quick side dish, just skip the topping and it's a simple stovetop dish. 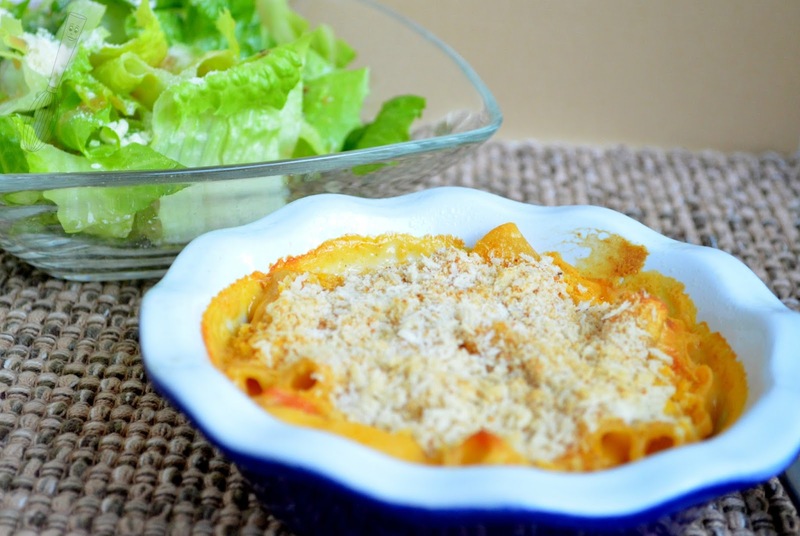 We like to eat mac and cheese as a main dish with a side salad. If you give it a whirl, leave a comment and let me know if you liked it :). 1. Preheat oven to 375F. Prepare pasta according to manufacturer’s directions. While the pasta is cooking prepare the sauce: In a medium saucepan combine the milk, flour, salt, and pepper. Cook over medium-high heat until the milk mixture comes to a simmer and thickens slightly. 2. Remove from heat and stir in the shredded cheese and cheese sauce. Drain the pasta and stir into the cheese sauce. Lightly grease three individual serving dishes or a 8 ½” x 4 ½” loaf pan. Pour the macaroni and cheese into the dish(s). 3. In a small bowl stir together the panko, bread crumbs, and cumin. Sprinkle over the macaroni and cheese. 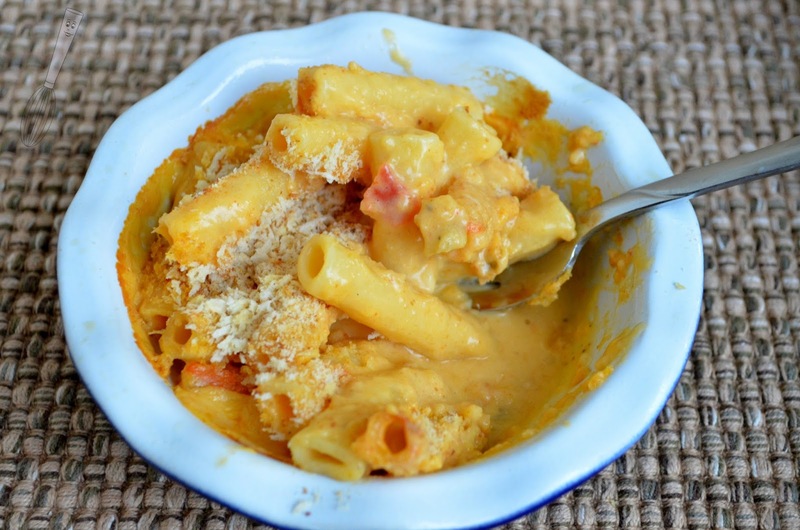 Bake for 18-20 minutes or until the topping is lightly browned and macaroni and cheese is bubbling around the edges. Let cool slightly, serve warm.